How do I get my baby to sleep later? Is your baby waking early? This is an issue that often crops up with babies and toddlers, once they’ve started sleeping through. There are a few things to look at in your child’s sleep environment and routine that could help. Tip number one is to ensure that the room is dark enough. The slightest change in light from the middle of the night to morning can stimulate a wake up, even for us as adults. 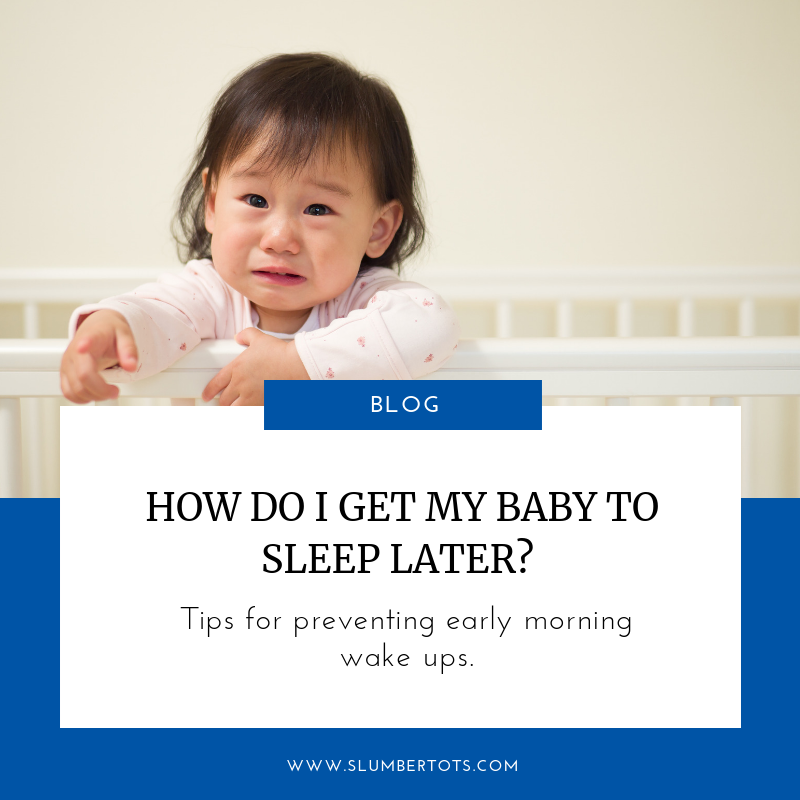 Babies have no concept of what time it is, so in the early morning they are suitably refreshed after sleeping for most of the night At this point they can be ready to start their day. Invest in a blackout blind or even tin foil and tape can work in the short term to keep it completely dark in their room! The next thing to consider is noise. It can be the birds starting to sing, the heating coming on in winter, your neighbour leaving early for work and slamming their car door. Whatever kind of environmental noise is going on can stimulate a wake up. It can be helpful to run some white noise in your child’s room to block out some of the noise. 3. What time is bedtime? Another thing to consider is bedtime. Most, people are tempted to try for a later bedtime in the hope of pushing the morning wake up a little later. In reality, early morning wake ups are often caused by overtiredness, so bedtime often needs to be earlier. 4. What is your child looking for on waking up? You should also have a look at what your child gets as soon as he or she wakes up. Sometimes, especially if your child previously used feeding as part of their sleep strategy, they could wake prematurely because they’re looking forward to it. It can be helpful to put some distance between your child waking up and then getting whatever it is they are looking forward to. So change their nappy, take them to the kitchen for breakfast first and then feed them. That can be enough to break the connection between waking up early and getting what they desire. My final tip is to hold on to your minimum. For me, it’s 6.45am. I don’t want my children to get up before then. We all need the sleep, so I’m not going to allow them to get up. Often even 5 or 10 minutes earlier can start to make a difference if you let them get up. Soon your wake up time has crept back 30 minutes, and then an hour earlier! Hold firm to your wake up time and avoid the creep! If you would like some support in dealing with early wakings, or any other sleep issues that your child may be experiencing, please have a look at the options available to work with me. You can also follow the link to book a call with me, or email me at katy@slumbertots.com.